President of Spain confirms it: Bill Gates named Extremadura Linux project as "a worldwide leader for ITC and open source"
Both the chairman of Microsoft, Bill Gates, and Spain's Prime Minister José Luis Rodriguez Zapatero have gotten involved in the debate on the type of software to be installed on 420,000 laptops for school students. The government and Microsoft want the 420,000 laptops to be fitted with Microsoft software. Spain's socialist party (PSOE) says the laptops should be be equipped with open source software. In a joint press conference with the Prime Minister on Tuesday, Gates said the acquisition of computers would be a "good investment in the students future" and a valuable experience for teachers. Gates talk caused some confusion in the Spanish press. He forgot the name of Spain's Aragon region, where students have been testing Microsoft's touch screen computer with Windows and MS Office since January. RTVE, Spain's national public TV network, claimed Gates was referring to a successful pilot project in schools in the region of Extremadura. 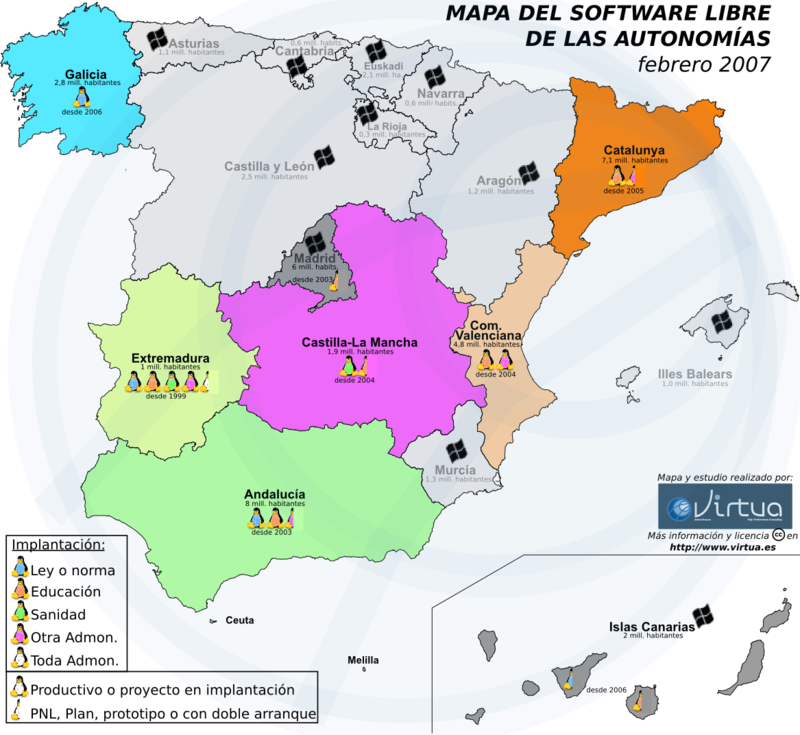 Actually, Extremadura is one of Spain's biggest examples of a GNU/Linux-based IT educational network. One of the poorest regions in Spain, in Extremadura two students share one PC. In the rest of the country, the average is fifteen students for each computer. As Linux Magazine reported, several other regional sources interpreted Gates' comments as vague praise for their own educational programmes. Meneame, a popular Spanish site where users post popular links to Internet sites, carried the headline, "Bill Gates honours the Extremadura Linux experience." Once RTVE noticed their mistake, they replaced "Extremadura" with "Aragon". But the story didn't finished with the correction of such a supposed "mistake", since, on Tuesday June 2nd, the President of Spain, Mr. Zapatero, confirmed in a public event that "Bill gates told me that 'there was a region in Spain that shines as a world leader because the extension of the new technologies and the open source in it, and this region is Extremadura'". Extremadura has been surely the first region in the world to introduce Linux massively in the schools. The Linex Project was started in 1999 and now it counts with more than 80.000 PCs among its schools with a ratio of 2 students per computer. Additionally, Extremadura has widely deployed Linux in more government areas, as Health and rural public points for Internet access and social digitalization. After Extremadura, Andalusia and Valencia, two of the most populated regions of Spain, have developed similar but bigger projects based on open source and Linux. In the case of Andalusia, its medium education holds currently the biggest Linux network in the world with more than 250.000 computers accounting clients and servers, all them administered from a central point in Seville, the capital of the region. On the other side, Microsoft has just got to develop a demo project in the low populated region of Aragón. The prototype is based on tablet PCs and electronic blackboards. The doubt is if such a prototype, paid and well promoted worldwide by Microsoft, can actually be deployed all around the country as the Government responsible of Education, Ms. Eva Almunia, a publicly known follower of Microsoft, is interested in. Has to be noticed that Ms. Almunia hold, previously to its current Government position, the responsibility of the education in Aragón. The Spanish free software association, Hispalinux, criticised the laptop plan in April, saying for instance that the government should have requested a public tender for the laptops. The debate now includes dual-boot systems with both GNU/Linux and Microsoft software pre-installed, raising questions about the Spanish government paying for proprietary software licences it might not use. Recently two more medium-low populated regions of Spain confirmed the signature of agreements with Microsoft for their education: Aragón and Castilla-León. Also there are serious rumors that the ITC responsible of Extremadura, Mr. Rafael Martín Espada, has reached an agreement with Microsoft for the migration of the Extremaduran education to Windows laptops. Mr. Martín Espada was recently named in its position replacing to one of the biggest political responsible persons of the Linux success in Extremadura: Mr. Carlos de Castro.